Louis Marie de Schyrver was born in Paris on October 12, 1862. His father was a well-established journalist, but his son did not follow the same path. From an extremely young age de Schryver recognized his precocious artistic capacities and began training for his career as an artist by twelve. 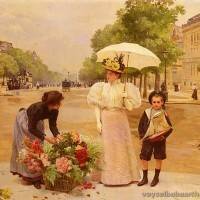 He was so talented that he exhibited his first works at the Salon (1876) at the age of thirteen: Marguerites et Chrysanthèmes (Marguerites and Chrysanthemums) and Violettes et Fleurs Printanières (Violets and Spring Flowers), two still life paintings. What is perhaps even more unusual was that at this time, he was apparently not studying under any master – his entry in the Salon catalog does not denote any specific teacher, though he may have been informally studying under an artist. The following year he continued his exhibitions at the Salon while studying under Philippe Rousseau, a still life and genre painter. It was unusual, though not unheard of, for a student of such a young age to enter the school of a master, where his fellow students may have been more than a decade older than he was. He remained under the tutelage of Rousseau for a very short period, since by the next Salon he had already left his atelier and was again without a teacher. Three years later, at the age of 17, he won a bronze medal at the World's Fair of Sydney for his painting entitled Lilas (Lilacs). De Schryver was clearly on a path to establish himself in not only the art world of Paris, but internationally, with themes that were attractive and appropriate for the time. He continued diligently submitting to the annual Salons, relying heavily on still lifes but also introducing portraits and genre scenes. By 1886 he had turned his attention to the daily life of Paris and began receiving commissions to paint portraits of society people. 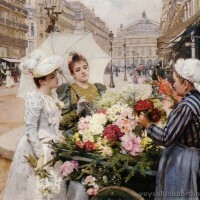 The depictions of contemporary daily life had become increasingly popular during the period of La Belle Époque as artists began to depict the bustling life and the various activities taking place in Paris, recording everything from the fashionable women of the period to the architectural subtleties of the city. 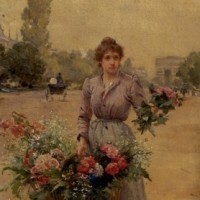 At the Salon of this same year he submitted Mes Derniers Fleurs (My Last Flowers), a fitting title for his transitioning thematic choice, and Le Premier Jour de Printemps (The First Day of Spring), receiving an honorable mention. Two years later he became a member of the Société des Artistes Français. Some of his garden spots vaguely touch on or could be compared with the Nymphéas by Claude Monet …Schryver demonstrates accents of passion, outbursts of pure color and tones which ring true. 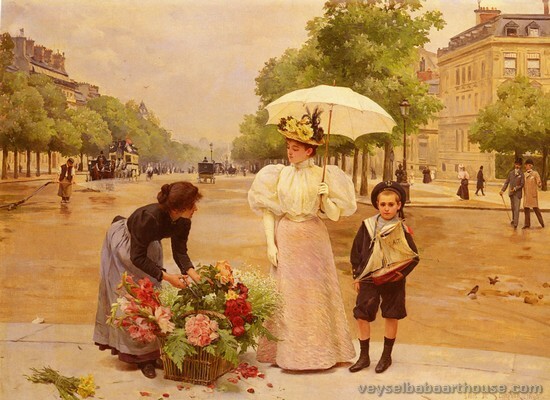 His scenes of Paris are often bathed in a light of rare subtlety – in shades of gray: the large canvas hanging in the white room at the Cambrai City Hall – Le marchand des quatre-saisons (Paris Salon 1895), is a masterpiece of sensibility. By 1891, de Schryver had entered the atelier of Gabriel Ferrier (1847-1914), a genre and still life painter, after having taken a substantial hiatus from formal training. To this year’s Salon he exhibited one painting entitled La Fin d’une Rêve (The End of a Dream), which earned him a third-class medal, his first medal received at the Parisian Salons. Throughout this period and until 1900, Schryver maintained a studio in Paris on the rue Pergolèse, giving him ample opportunity to step outside to find his new subject matter. His work submitted to the Exposition Universelle of 1900 earned him a gold medal. This same year he left Paris and built a home in Neuilly, coinciding with a shift in his work wherein he turned to portraiture and costume painting featuring elegant men and women from a bygone era, dressed in their silks and satins. 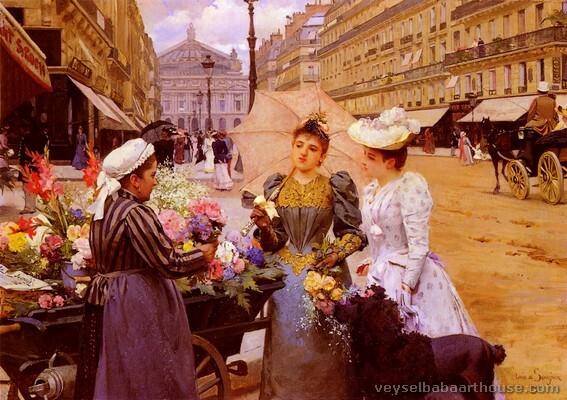 As with his earlier Paris street scenes, these paintings found a ready clientele both at home and abroad. 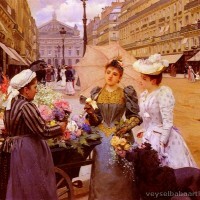 In 1901 he exhibited Lesbiennes (Lesbians) at the Salon, a painting that many claimed was a brilliant work of art, but one that created such a scandal that it had to be removed from the show. ... his work for the Salon of 1907, L’arrivée du vainqueur au Premier prix de l’Automobile Club … shows him to be a forerunner of the Futurist artists Giacomo Balla and Carlo Carra: the viewer gets the same flashing impression as a driver would get of the thrill of color before a large crowd – the sensation of speed and the rush of air is knowingly created by the soft light of the surroundings, by the power and suspense, by the trembling, by the touch of jolts cutting through the wheels. What Schurr fails to mention was that this work was shown more specifically at the Salon des Artistes Indépendants, one of the exhibitions which tried to provide artists with an outlet besides the annual Salon for the display of their work. These exhibitions were more progressive and showed an appreciation of new artistic trends that were often not recognized by the annual Salons (des Artistes Français). These works also were linked to the increasing interest in photography during the period, which could capture what would not be discernible to the naked eye. Artists began using photography more and more not only for models, but also to pique their interest in the physical action, that could now be documented and studied. Many of Schryver’s automobile works were captured in a more impressionistic style with beautiful color and quick brushstrokes, but he found little acceptance for them in the market place. By 1910, for financial reasons, he returned to his successful images of Paris at the turn or the century. Between 1919 and 1925 he traveled to the Rhineland to study and paint the landscape of this occupied territory. He returned to Neuilly many times and, from time to time, would go back to Paris; he died there on December 6, 1942 at the age of 80. De Schryver continued to exhibit at the Salons, albeit sporadically, until the end of his life. 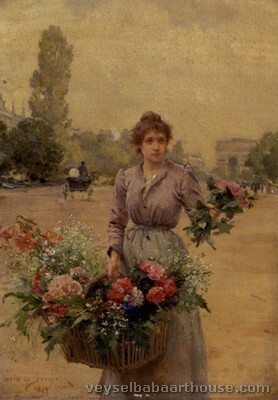 Throughout his career he had been witness to the fluctuating artistic temperament of the art world of Paris, but he had maintained similar themes throughout his career; beginning early on with still lifes and portraiture, finding his greatest success with his Parisian scenes, dabbling for a short time in the culture of the automobile, but then returning to his popular Parisian scenes after also working with landscapes. 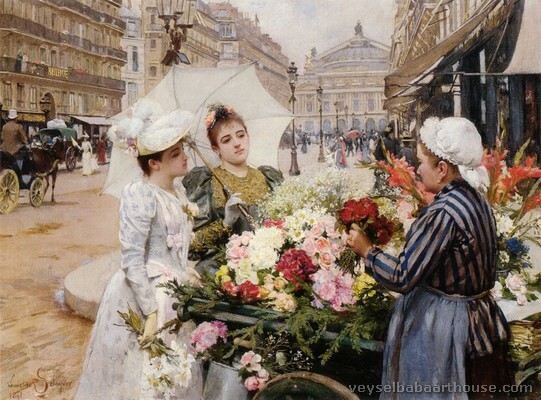 Louis Marie de Schryver’s images contributed to the interest in contemporary scenes of Parisian life that remained popular throughout the majority of his lifetime.